Carrie Bridges reviews sleeve gastrectomy in Tijuana, Mx. Carrie traveled with her brother to the Mexican border city to have her weight loss surgery. Calling her experience positive “in every way”, Carrie says it was better than her anticipation. 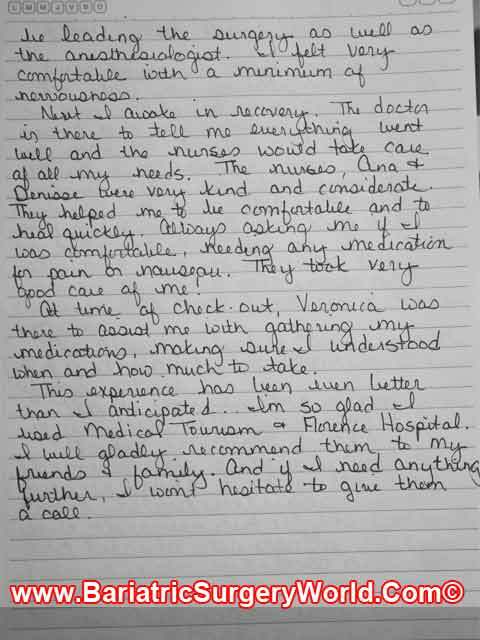 My experience with Medical Tourism has been positive in every way. When I first contacted my case worker well over a year ago, she answered all my questions and offered several suggestions. Over the year she has kept in contact with me to confirm my progress. When I was finally able to schedule my procedure, Regene, my case worker was very helpful in explaining the process and sending me information. Regene made sure I had all my paperwork in order so when I arrived in San Diego I was ready. She made arrangements for me to be picked up and brought to Tijuana. Once I arrived in Tijuana, Veronica was quick to introduce herself and show me around. She was very helpful with my brother (my guest) in suggesting places he might want to see and places to eat while waiting on me. The day of my surgery was very smooth. They settled me in my room and Dr. Reno explained each step of the process, answering all my questions. I was also introduced to Dr. Camelo who would be leading the surgery as well as the anesthesiologist. I felt very comfortable with a minimum of nervousness. Carrie’s is not the only positive review relaying out of the Mexican medical tourism hub. Check out another video testimonial on gastric sleeve in Tijuana in which a Henderson, Texas resident talks at length about her experience. Contact us through the quote-form on the right for more information and a gratis Weight Loss Surgery Quote.